Is anyone actually using BIM successfully in Vectoworks? 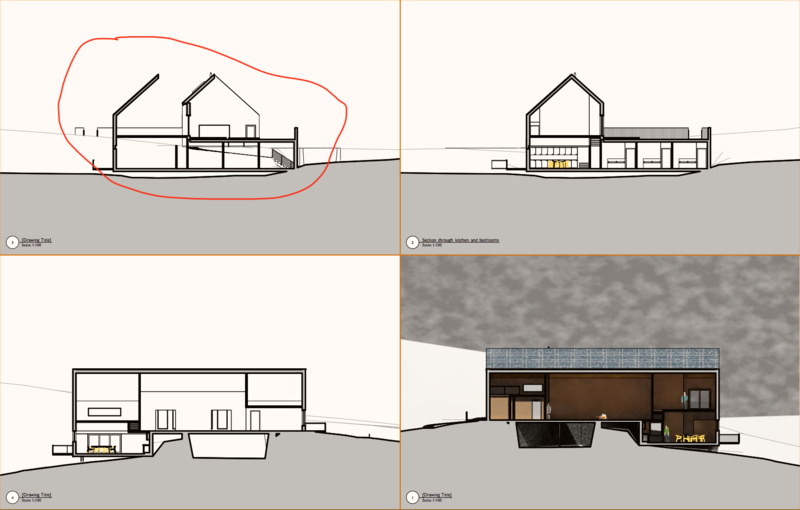 We have been trying to use 3D models constructed using the vectorworks BIM tools, ie the wall, roof, slab and window tools, to design buildings for a while now, but we have never made it past RIBA outline design stage before we encounter a bug which causes 2D drawing generation to fail catastrophically due to faults in the software. At this point we end up redrawing the whole thing in 2D and the model gets abandoned because why maintain 2 sets of information. See example of broken section generation attached. We are also currently having problems with hatches disappearing and parts of roofs disappearing. All these have been reported to tech support but they are unable to suggest a work-around, which is how I can be sure its due to faulty software. All these problems are occurring in 2018 SP2. We have had plenty of other different problems in previous versions of the software. Is this a common experience? Are others out there managing to make it work? I had similar problems with Microstation Triforma about 10 years ago. Are others having more success with other packages like ArchiCAD and Revit, Rhino? I know BIM advocates say 2D is dead etc, but no regulatory authority in the UK accepts 3D information for submission or is likely to in the foreseeable future. We still have to be able to print paper drawings for them to be stamped for 'Planning Permission' and 'Building Warrant' approvals. So 2D drawing generation with a high degree of reliability (99.999%) and control over output is absolutely essential and we still don't seem to be there. I've had some problems here and there with Section Viewports over the years. Upload the file here or message me if you like and I'll take a look. Hey Will, I've had look through you model and think I've found the problem. There are quite a few objects that are not on their correct Class. And crucially many of them are actually in the Site-DTM-Model Class (.e.g. one of the roof faces and the flat roof slab), which is a special Class. Some objects may be missing from your Section Viewport simply because they're on a wrong Class, but I think the real problem here—and the reason objects are showing that shouldn't be–is that many of them are on the DTM Class. So my advice is to go through the entire model with a fine tooth comb, without rushing things—preferably with no one able to interrupt you—and make sure every single object and all components of objects are on the Class you expect them to be on. But especially make sure that only site model objects are on the DTM Classes. Thanks Christiaan, I have corrected the classes but it makes no difference. The top left section is displaying geometry which does not exist at that location in the 3D model so even if this was related to having objects in special classes it is not 'failing safe'. Imagine if the error was much harder to notice, just a wall 150mm out of place. You make a quick check with the measuring tool at planning permission stage and it checks out, then you come to do stair details and you realise that you can't fit, for example, a stair which complies with regulations into the space. It could easily cause a problem that would cost someone a lot of money and embarrassment. Its a nightmare. Also, if you set the background render to a render works style, you will see all the geometry displaying in the correct location, it's only the hidden line view where this view fails to draw correctly. But, I can't submit rendered views for technical approval, they are required to be line drawings. Also you can't dimension rendered views. Will, yes, I see. I was getting clean sections once I had tidied up the Classes but I think that was coincidental. The more I dabble with your file the more it reminds of a nasty bug I ran into a couple of years back where Section Viewports would display geometry where it shouldn't be. I never got to the bottom of it and put it down to file corruption. Thankfully I haven't experienced it since and we've successfully modelled tens of buildings since then. 1. Create a new file, reference this file into it, then delete the reference and keep all the resources in the new file and recreate all the sheet layers. Then test to see if the problems still exist. This can sometimes leave behind file corruption problems. 2. Create a new file and remodel everything afresh. I would spend a couple of hours on approach 1 and then, if you still see problems, get on with approach 2. This sounds like a huge thing do but I think you'll find it quicker in the long run. Plus you'll have the existing model as reference and you'll be able to make efficiency improvements (including cleaning Class organisation), making it easier to trouble-shoot the file. @Will one of the engineers here has requested your file, if you could message it my way I'll pass it on. We had the same issue with section viewports not showing information correctly in 2018. It was on files converted from 2017. It didn't occur on every file converted, but we reverted back to using 2017 on the problematic files as we couldn't find a work around to fix the issue & didn't want to spend any more time trying to fix it. Chiming in here as well with same reason as others. Converted files are problematic. It has affected our wall styles/textures/section viewports. Rule of thumb for us is to never switch versions in a projects life cycle. With regards to the OP's topic header, Yes we have been using BIM successfully. Our workflow still incorporates 2D overlays still (wall cuts/flooring/insulation), in the 'annotation space' of viewports.